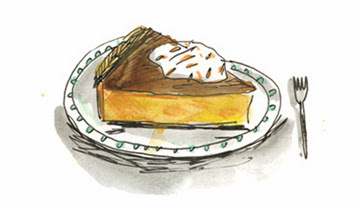 Thanksgiving is really the best time of year to be the keeper of a nerdy blog about pie. It's been so nice the past few days to have friends and readers from all over the country (and one in the UK!) 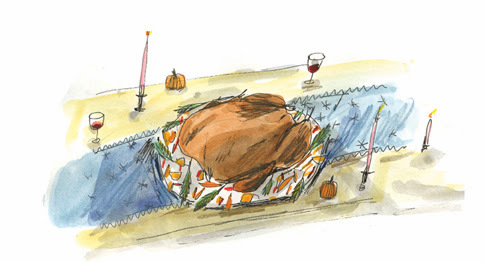 send photos of their pie creations (I've posted a few here) or ask for advice about substitutions or cooking temps or burnt pears (you know who you are) or send exclamations of satisfaction. It's as if I get to share a little bit of your celebration with you, and I'm thankful for that. I hope everyone had a lovely day yesterday with friends and family and delicious food, and now you're enjoying some pie for breakfast and a big cup of coffee at home and not out out in the shopping madness. If you do want to do a little at home shopping, though, Elizabeth Graeber is running a Holiday Sale in her shop, which includes our PIE. A Hand Drawn Almanac, and all of her many other beautiful illustrated goods! Get $5 off of every order of $30 or more, which means two Pie Almanacs will cost ya just $25. And if you're looking for more ways to shop local & handmade, check out the Handmade Holiday series on Witchin' in the Kitchen which profiles three women artisans whose work makes lovely gifts.